The final four contenders will be revealed and step into Gladiator Arena for the last time to determine who will be American Gladiator Champions. One man and one woman will walk away with the ultimate prize tonight! “American Gladiators” is hosted by Hulk Hogan ("Hogan Knows Best") and Laila Ali ("Dancing with the Stars”). Four new contenders burst into Gladiator Arena as the race towards the semi-finals heats up. On the women’s side, 20-year-old college student Annie Castellano from Stoneham, Massachusetts takes on 52-year-old investment team manager Yoko Ohigashi from Brea, California. For the men, dolphin trainer Alejandro Soto from El, Cajon, California battles camp media director Tim Oliphant from Branson, Missouri. “American Gladiators” is hosted by Hulk Hogan ("Hogan Knows Best") and Laila Ali ("Dancing with the Stars”). 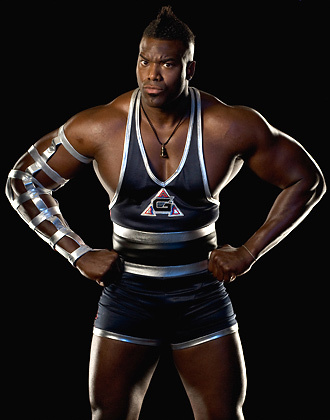 The only male contender to take on the Gladiators during Season One and live to tell the tale, Rocket explodes with blazing speed every time he’s launched into the Gladiator Arena. This is one ruthless competitor who will charm you with a blinding smile right until the moment he roars up beside you like lightning, to toss you to your doom. Q. Mark, RealityWanted.com: Evan Dollard, what’s up buddy? A. Evan Dollard aka Rocket From American Gladiators: I am doing well man, things are good. Tipping the scales at almost 300 pounds of power and with 20-inch guns at his disposal, Justice does indeed have a very long arm, and he'll pursue any adversary to the ends of the earth to prove it. Ask any of his opponents and they'll tell you that sometimes Justice hurts, and the scales always tip in his favor. Q. Mark, RealityWanted.com: How is it going man? A. Justice Smith, American Gladiators: Great man, it’s going real good. How is it going with you?